This will be a blog about applied psychology in the classroom. Which is fascinating to me. I will try to comment on articles on Gamification and Distance Learning with links to the article I am discussing. We can also talk about other cool and intellectually stimulating topics here. Take me to a cool website! As the years are passing at Phoenix, I am becoming more aware of Defiance as a positive force. Students who are labelled "Defiant" have an overdeveloped sense of justice and injustice. Every year I teach Randy Pausch's "The Last Lecture" as the final text to my Senior class. This year though, my Senior class has been with me for all four years of high school, as I was allowed to "loop up" with them. This makes the reading doubly important to me. I usually see it as a last chance to build skills before graduation, and maybe instill some of Pausch's wisdom. But this year, it is also my sendoff, and the jumping off point for our "Portfolio Defense" Projects, or as I'm calling it, "Presenting for The Wall. To be truly honest, I, Jedi is only on that list because you should read it at some point. It remains the single most read book in my life. I wanted to talk about pushups in my classroom when I started writing this entry back in May 2014. I wanted to talk about how restorative practices can feel so much more glacial than simple punitive exchanges with students with negative behaviors. I've spent enough time trying to do restorative practices to hate that phrase, "negative behaviors." It is as if the behavior just "happened" and exists without context. My wife and I go back and forth on how much context can be blamed for bad decisions, and how much agency a person truly has for their own choices. I have come the the belief that people own their actions more when they are aware of more alternatives. When there seem to be no alternatives, and people make bad choices from a narrow set of bad options, I don't disparage the person, I disparage the systems that failed to inform them of better options. I do believe that there are ladders out of drug-based livelihoods. The best ladder is education. When taken seriously as a way out, it can leave the Trap behind. It's really hard to sell education as a way out though. My first year teaching I had a student bring in $300 dollars in twenties. He was waving it around the class bragging. He was in ninth grade. Educators need to be able to speak to that, as well as Iago's running Irony. I started doing pushups instead of write-ups last year. When a student is labelled "Oppositional Defiant" they are marked as the sort of person who fights authority regardless of the authority figures intentions. Control is paramount for this student. A sense of freedom is their highest goal. Many of my students are OD. I was OD in school, too. When I directly oppose my students we all fall into very played out roles. Watch a teacher whose been at it a long time and you'll see how exasperated they get when someone acts out. The thought process is, "Oh here we go, I've got to shut this kid down, or get him/her out of the room before I lose the lesson I put together for today." Direct conflict with an OD kid breeds direct conflict. They don't back down, they don't respect authority by their very nature. But they do respect novelty, they respect innovation, and above all, they respect respect given to them. So last year, when I was with my most OD class, the hardest class of the day, when a student would disrespect me or another student I would ask, "Push-up, or sit-up?" They would have to choose which, and then I would get down on the floor and do a push-up or a sit-up. Eye contact is key. Here I am. Here is the man who will take your entire book and read it with you. Here is the man who will burn untold hours bringing you assignments to choose from, rather than assigning specific projects because he gets why you hate being controlled. Here is the man who dresses up to come in to work, always wears a button down shirt and a blazer. Here is the man who will read your daily journals and ask if you are okay when you stop writing like you normally do. Here is that man, on the floor, because of your language, because of your weakness pushed onto another person. Behavior in my class has improved quite a bit since. We're going to GenCon!! The group of teachers at my school who use Gamification to inform their instruction are going to be presenting at GenCon this summer! Huzzah! It feels awesome to have outside validation that what you are doing (or in this case, trying to do) is a truly innovative technique. The crew at Phoenix who use Gamification to influence their classroom dynamics are really dedicated to finding something that works for our students. Our kids despised their traditional schools and either actively rebelled or were forgotten in the noise created by the normal Traditional School models in JCPS. By changing our pedagogy to match structures they use for fun, we've used our understanding of our audience to improve their buy-in in a really important way. I'm stoked to get to present with the Phoenix team this July! Woot! In other, non-related more science-y news, I think I know why the EMDrive that NASA turned on recently functions and produces thrust. Or, at least, I think I can name the sort of phenomenon. Which has more than likely been done, but, eh, here goes. I think the engine is another example of "macroscopic quantum phenomena", similar to "superfluids" or "superconductivity" under extreme scenarios (http://en.wikipedia.org/wiki/Macroscopic_quantum_phenomena). It reminds me of the sort of controlled situation in which these other phenomena are occurring. Why choice? Or, Why burden your students with near Kierkegaardian freedom?! I have been working with game mechanics in my classroom management for the past two years now and I've learned a lot about what motivates and what stifles students (especially students who are normally Defiant). 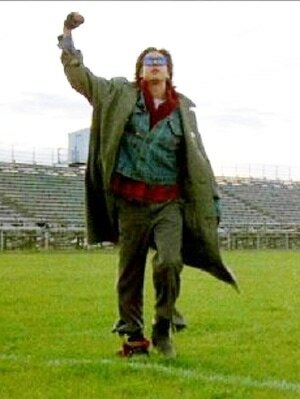 Working with students who are defiant feels like home court for me. I was the kid trying to check the Anarchist Cookbook out of Floyd Central's library while I was there. I have found that students who are defiant of their teacher are mostly angry at the "system" at large, not their classroom teacher. Most of my disenfranchised students became unwilling to work with Public Ed. through years of being passed around from school to school, or by, in my words, allowing their behavior to be the excuse that their teacher uses to not teach them. Five minutes of misbehavior in a classroom can often end with a day in ISAP or hours of conversations with authority when students aren't correctly managed in the classroom (something I'm still working on as a 3rd year teacher). Part of what keeps my students from railing against my authority as their teacher is the "Kierkegaardian Freedom" their homework assignments present them with. They have a nearly limitless (if you count "The Visionary" an assignment where they design a rubric for other students) number of possible homework assignments to choose from. All of these assignments have commonalities that allow me to grade them under English or Creative Writing, but it is this freedom of choice that students feel, that makes the assignments meaningful not just as classwork, but as self-driven inquiry into a subject that interests my students. 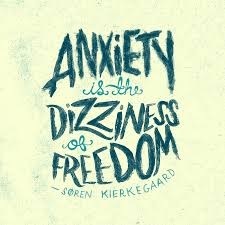 Kierkegaard talks about how the "anxiety" induced by being aware of many possibilities that are presented to us as people. He discusses how this drives us to choose between the myriad of options and thus, find who we truly are. I buy this. I believe that without choice in their education, students are doomed to become rote memorization machines who can only solve problems that other people put into easily digested formulas. When students determine the setting of their learning, they have the home court advantage and will cement lessons on Research, Writing, or Mechanics. Let me know what you think, and have a solid day! So I just googled "Othello and House of Cards" and saw that there are a few other people pointing out this similarities between Francis and Iago, but I wanted to throw my two cents into the mix as well. Really it isn't just House of Cards lately that I've been seeing so much Shakespeare in, Breaking Bad and True Detective also have turns and handle archetypes in a way that strongly reminds me of what I've been teaching for the past couple of weeks. We just finished a Unit on Macbeth with the Seniors and this is the second year that I have taught Macbeth. I have to say that watching the whole series of Breaking Bad over Christmas break was a great way to get ready to teach this play. There are so many correlations between Walt's downfall and Macbeth's (though Skyler is reluctant while Lady Macbeth wears the pants in the evil). Francis' relationship with his wife in House of Cards is decidedly better(?) than that of Iago and Emilia in Othello (though if they are at odds with one another in Season three and he decides that she is a liability then things will align a bit better). Claire is complicit in a much more Lady Macbeth manner than Emilia is to Iago's evil plans in Othello. The way Francis interacts with Chloe (spoilers) is also very much the relationship between Iago and Roderigo in Othello (the power in the relationship is extremely one sided and when Chloe/Roderigo becomes a threat they are easily dealt with). I think it is kind of poetic (ironic?) that television has become the most likely medium for long form studies of archetypes the way Shakespeare did. Hank plays a wonderful Macduff for a while and Jesse Pinkman makes a great Roderigo again (especially when Walt keeps reeling him back in with flattery). That television is beginning to take Shakespearean ques also should open up a wealth of opportunities for Undergraduate Courses. Imagine a Shakespeare and Television course studying Vince Gilligan. On a separate note, I need to read Richard III because Francis is supposedly also based off of that play. Spring Break! Also, first post! Alright! I've been reading this cool book called "The Irony of American History" and it has made me think a lot about the ironic facets of Education in America as well as Irony in general (which is fitting with all the Shakespeare going on in my room at the moment). Teaching Othello and Macbeth at the same time is like a cool oasis in the Spring. Just when students are getting most antsy because summer feels impossibly far of, BOOM! ACTING! STAND UP AND PARTICIPATE! WHO WANTS A NERF SWORD! I've been thinking about how ironic it is to increase only the quantitative data that the state consumes from student's efforts (testing yadayada) in an effort to increase the qualitative output of a generation. I think the cost of this ironic failure (ironic because in education we are in it to facilitate growth not measure stasis) will be unimaginative and cookie cutter minds, just when the world needs more radically connected and synthesis oriented people. I'm not afraid of data though. The game that I run in my gamified sophomore classes produces oodles of data from which I can extrapolate many useful things. Increased or decreased engagement. Specific learning modalities as chosen by students (based on which kind of assignments students choose most). Preferences for giant candy... and on. Part of my goal in implementing gamification in my classroom is to produce data that can be considered meta-data by the end of student tenure with me at my school (also, big honking portfolios), I think that as an educator I owe it to the students I am working with to show them how their trends make them look. The world (and the job market specifically) will only increasingly define them by their behavioral trends as expressed through meta-data and data mining algorithms. I want them to know that they will be judged not by their single best day, but by all their days (that are measured) combined. So. Open comments. Your thoughts on Spring Break, Meta-Data, the Irony of American History, or Semi-Sythetic organisms (Science Friday was SO COOL today).